You have probably hear of the term "foo-fighters" those strange orbs that follow planes. A reader sent me image of one apparently captured on Google earth -or is it simply a technical mishap or lens reflection? You can verify the image is real by seeing from Googles website. Would like your comments on this one. That looks like an optical effect in the atmosphere to me - the apparent ufo is a reflection of the plane and its contrail. I used Google translate from part of the story. Aircraft to the next ball of light can be found explanation. A branch of the satellite images are taken using different channels, one of which describes the colors and the second luminescence, or brightness. 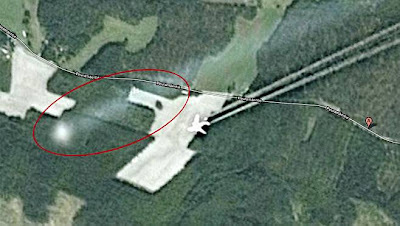 If the images can not be taken in exactly the same one-hundredth part of seconds, fast moving object may be a "shadow", as Jämsä example of an aircraft. The light ball is, therefore, next to the passing plane.